For Bronia, Edek, and Ruth Balicki their life began to fall apart when their father was arrested in 1940 and sent to a prisoner of war camp. Their mother was taken away by the Germans soon after this, and the children took refuge in the cellar of a bombed out building somewhere in the city of Warsaw. Eleven year old Edek took over the job of finding ways to get food for his family and Ruth started a little school for the lost or orphaned children who lived in the ruined buildings of the city. Then Edek disappeared, presumably arrested by the Germans for smuggling. Somehow, for two years, Ruth and Bronia survived, though life in Warsaw became harder and harder as the Germans and Russians fought over it. In 1945 the Russians were finally in occupation and that was when Ruth found Jan, sick and half starved and lying on a pile of rubble. Being a kind hearted soul Ruth took him in and nursed him back to health as best she could. When Jan got better Ruth discovered that he carried a small silver sword with him, which he kept in a wooden box. With amazement Ruth realized that the sword was the one which had belonged to her father. Jan explained that Joseph Balicki had escaped from the prisoner of war camp where he had been imprisoned and he had come to Warsaw to find his family. After looking fruitlessly for many days Joseph had decided to go to Germany to try to find his wife. He had left the sword with Jan asking the boy to find Ruth and to give it to her. Jan was supposed to tell her to go to Switzerland where her father would go once he had found his wife. Eager to be reunited with their father, Ruth and Bronia, with Jan in tow, set off for Switzerland. The journey was a hard one and they had to face many hardships. One good thing that happened was that they found Edek in a village in Poland. He was sick with TB but he insisted on traveling to Switzerland with his sisters and Jan. This is one of those stories which you read and never forget. With great candor and honesty the author shows his readers what Europe was like both during and after World War II. Chaos was everywhere, with refugees crossing from country to country looking for family members and for a secure place to live. Jan's lying and thieving ways provide a powerful foil for Ruth's goodness, courage and determination. And yet, though he is incorrigible, one cannot help liking Jan, hoping that he will find what he so obviously needs, a family to love him. 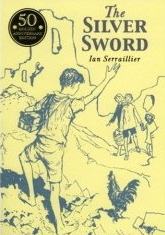 Based on the true stories of children whose lives were torn apart by World War II, Ian Serraillier's book has lost none of its power with the passage of time. It is as accessible now as it was when it was first published in the mid 1950's. In addition, the book has relevance to the present day because children around the world are still victims of war.